Give Mom Flowers for Her Fence this Mother’s Day! Give mom flowers that will boost her curb appeal and home value! Mother’s Day is this weekend, and it can be very difficult to find a gift that expresses to your mother how much she means to you. Living fences or floral fences are growing in popularity and very beautiful. How can you give your mother flowers for her fence this Mother’s Day? Does she like flowering vines or leafy vines? Would she love an evergreen vine or deciduous vine for Mother’s Day? Do you want to use an annual vine or perennial vine? 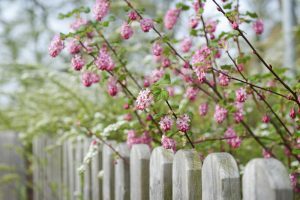 Planting a living fence can be a tall task, so get your brothers and sisters involved in this Mother’s Day gift if you can. Be sure to research the best positions to attach vines to encourage growth. Also, unless your mother has a natural green thumb, make sure to write up care instructions so she knows how often to take care of her living fence. While most vines are very durable and grow on their own, they might need a little extra care during the summer months. This entry was posted on Sunday, May 14th, 2017 at 8:17 pm. Both comments and pings are currently closed.